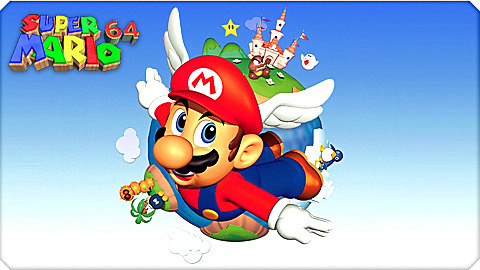 Super Mario 64 was, without doubt, one of the biggest game changers of the industry. 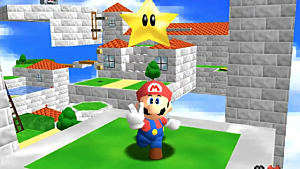 Nintendo were able to take their 2D platforming hero Mario and expertly transfer him into a 3D environment. While it may not have technically been the first ever 3D game, it's very much considered to be just because of how it seemed to get everything right. To this day, it's still regarded as one of the best videogames ever made and, due to its 2004 DS remake, was a killer app for two different systems. Said remake is now finally coming to the Wii U Virtual Console in North America; about seven months after everyone else got it, so to mark the occasion, here's a few fun facts about both the original and remake that you may not have known. While the game may have originally released on the N64, Nintendo's big, fancy new console at the time, it actually didn't use the new processing power to its fullest. In fact, Super Mario 64 only ran in 32-bits. This was actually common for a lot of other N64 games at the time, since 32-bit code executes faster and requires less storage space. For those of you not familiar with the game, before the final battle with Bowser, you need to collect a certain number of Power Stars. If you don't have enough, the staircase leading to him will go on forever. 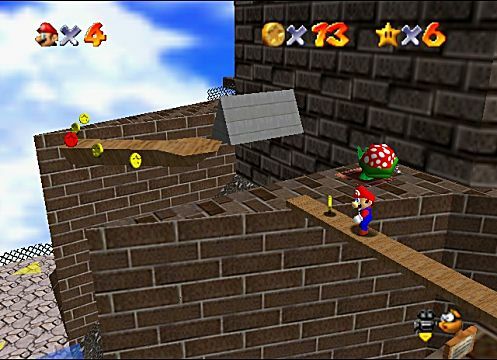 What's interesting, though, is the music that plays whilst Mario attempts to climb it. Notice anything weird about it? It's what's called a Shepard tone - a sequence of notes which create the illusion that they are infinitely ascending in tone when it's actually just looping. Much like the stairs, the music tricks you into thinking it's rising to something. Give it a listen if you want to risk going stir crazy. Even though Mario's lean and green brother never appears in the original game, there was an ongoing rumour that Luigi was actually playable. 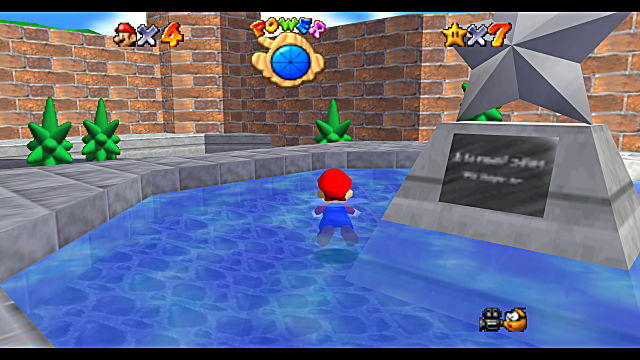 There's a plaque on the statue in the castle courtyard's pond with some fuzzy text that many people believe reads "L is real 2041" or "L is real 2401." It could be meaningless drivel but it became a popular theory that it was a clue to unlocking Luigi. 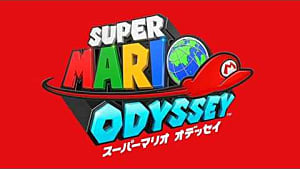 Of course, it wasn't true but Luigi was supposedly planned to be included (along with a multiplayer function) but, due to hardware limitations, was scrapped early on in development so they could create more elaborate levels This makes Super Mario 64 one of the few mainstream Mario games to not feature Luigi. 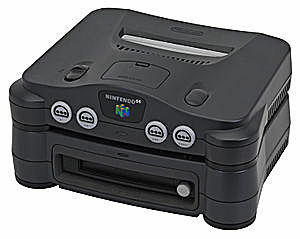 While the multiplayer feature was scrapped, Nintendo did plan to incorporate it in a sequel for their 64DD, an disk drive expansion for the N64. It was simply called Super Mario 64 2 and would've included co-op and a playable Luigi, but the project was cancelled and Nintendo decided to focus on creating a new game for the GameCube. The failure of the 64DD itself may have contributed as well. 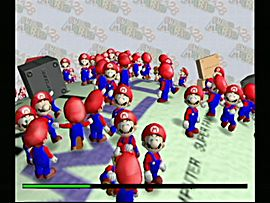 Speaking of the GameCube, there was an early tech demo in 2000 for it titled Super Mario 128, which showed off 128 Marios running around a circular board. Though it never became a fully fledged Mario game, its physics concepts were used for many other GameCube games; the most notable being Pikmin. And while it never really went anywhere outside of a tech demo, it was also referenced to in Super Smash Bros. Melee. 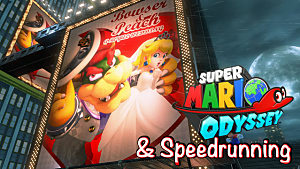 One the event matches shares the same name as the demo and has the player fight 128 tiny Marios. It's pretty obvious that the Mario series is child-friendly. What kid hasn't played at least ONE Mario game? 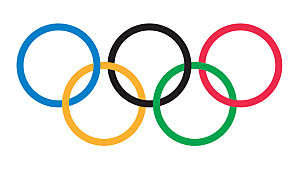 However, content regulations in Europe have become much stricter over the years. When Super Mario 64 DS was first released, it was naturally given an age rating of PEGI 3 (which means it's suitable for anyone over the age of 3). When it was re-released on the Wii U Virtual Console, this was changed to a PEGI 12. 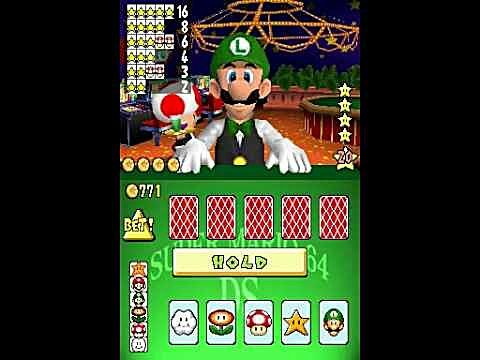 This is because some of the mini-games included in the remake revolve around the concept of gambling. 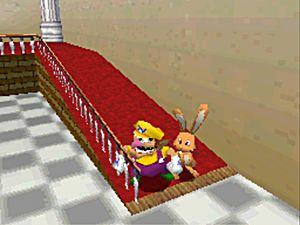 In order to unlock mini-games in the remake, you have to find rabbits scattered around the castle and catch them. In doing so, they reward you with keys that unlock the mini-games when taken to the rec room. 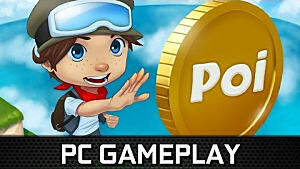 In the South Korean version of the game, though, the rabbits, keys and mini-games have been removed entirely. The reason for this is unknown, though it's suspected that it's most likely because of the inclusion of gambling-focused mini-games again. 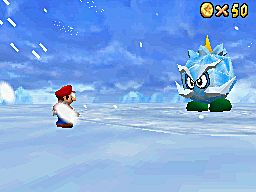 In the DS remake, the level "Chief Chilly Challenge" is only accessible to Luigi, meaning he's the only who can fight Chief Chilly, although there are caps he can wear which turn him into either Mario or Wario. Depending on which of the three characters you're controlling, Chief Chilly will have different dialogue. So, of all four playable characters, Yoshi is the only who can't fight Chief Chilly... or so you'd think. It's possible to have Yoshi enter the level by using cheat codes or a glitch, but what's strange is that Chief Chilly does have unique dialogue for Yoshi too, saying "Hmm? I see you have no mustache. Poor, bald, little creature. It's not a fair fight for you, but luckily, I'm not a fair fighter. Let's go!" When defeated, he'll say "I simply cannot believe that I lost to a hairless pip-squeak like you! My mustache was my only joy. Now what am I going to do?" 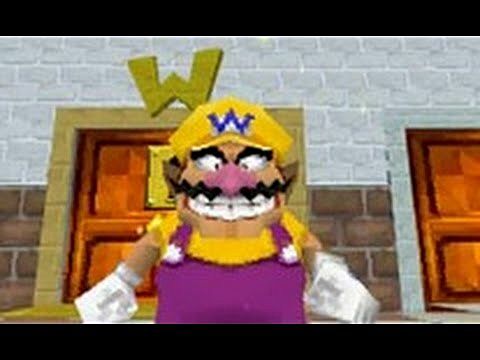 Wario may be one of the most recognisable stars of the Mario series, and has even had many adventures of his own in the Wario Land and WarioWare series, but Super Mario 64 DS marks the only time he's ever been playable in the main Mario series. 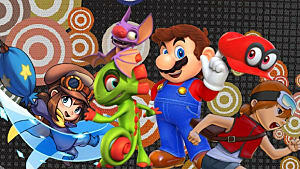 Funnily enough, remember that playable Luigi rumour? Well, with both Luigi and Wario included in the remake, it ended up sparking another theory/rumour that there was a hidden, playable character - this time, it was believed to be Luigi's gangling doppelganger, Waluigi. 10. No, It's-a Yoshi Time! 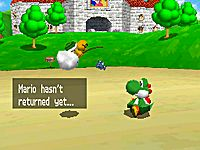 The remake is also the only time that Yoshi is a playable character in the series and NOT ridden or controlled by another character. In fact, it's possible to acquire 33 of the game's Power Stars before you need to save and unlock Mario. You don't even need to save Luigi and Wario to clear the game and beat Bowser (unless you're going for 100% completion, of course). Was Super Mario 64 a Collectathon?